Every week, I scour the web to find inspiring outfits on your favorite celebs and help you recreate their looks! This week, I was inspired by Lucy Hale, Margot Robbie, and Bar Refaeli, who all rocked white sneakers. Read on to see how you can get their looks for yourself. Actress Lucy Hale grabbed some coffee in Los Angeles in a rocker-inspired look paired with her low-top white sneakers. Simple white sneakers like Lucy’s have become a fashion staple these past few seasons, surely because of their comfort , versatility, and timelessness. 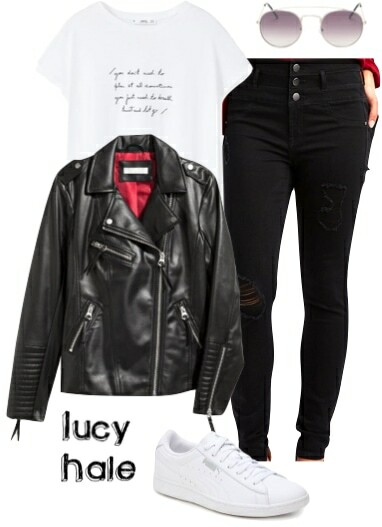 Lucy wore her low-tops with black skinny jeans with a stacked button closure, a white graphic print t-shirt, a black leather moto jacket with silver hardware, and round metal sunglasses. Her look is edgy yet effortless. Lucy’s look is casual enough for a day of hanging out or running errands, but is certainly cool enough to rock for an evening out, as well. Start with a pair of white low-top sneakers for a laid-back vibe, and pair them with some black skinny jeans; these feature stacked silver buttons similar to Lucy’s jeans for added flair. This white t-shirt with a graphic print is a great dupe for Lucy’s, though any black and white graphic tee will do. Give the outfit additional edge with a faux leather biker jacket and some vintage-inspired round metal sunglasses. While traveling this week, Margot Robbie looked totally put-together in a cute, casual look. Margot paired her white low-top sneakers with a printed navy wrap dress with long sleeves and a ruffled neckline, making for a cool contrast. Margot kept her accessories light, simply wearing a dainty gold pendant necklace and carrying a structured black saddle bag, in order to let her dress shine. Margot’s ensemble proves just how versatile simple white sneakers can be: not just reserved for casual outfits, they look fashion-forward with dressy outfits, too. This navy long-sleeved wrap dress features a ruffled neckline similar to Margot’s, as well as a feminine floral print with hints of white that tie in the sneakers. Since the print is so eye-catching, keep accessories simple by wearing a delicate pendant necklace and carrying a trendy structured saddle bag. I love the tassel detailing on the one I’ve featured in the outfit re-creation! For dressier nighttime wear, swap the sneakers out for some cute ankle booties or knee-high boots. Model Bar Refaeli seems to know that the most effective shopping is done in comfy footwear, so she wore her white Converse low-tops for the occasion. 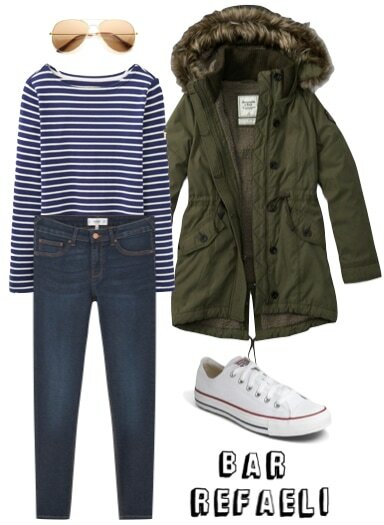 Bar kept her look casual yet cute by pairing the sneakers with some dark wash skinny jeans, a navy and white striped top, a green parka with a fur collar, and some aviator sunglasses. Bar’s ensemble is a classic combination that isn’t dependent on trends, and includes pieces you may already have in your wardrobe. Bar’s outfit features pieces that are ultra versatile and are likely things you already own. Dark wash skinny jeans paired with a blue and white striped jersey top and low-top Converse sneakers (or any white low-top sneakers of your choosing) form a super classic look that works for any season. For winter wear, bundle up in an olive green, military-inspired parka with a faux fur hood and complete the ensemble with some aviator sunglasses for a day out and about.